Claiming to be Europe’s leading and trusted herbal hair care company for thinning and/or damaged hair is a lot of pressure to be under. 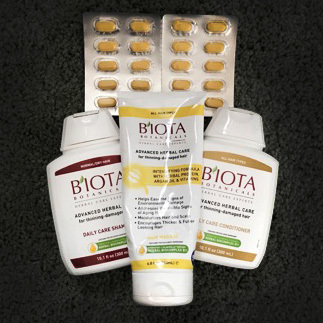 However, Biota Botanical Herbal Care know how to take that pressure in stride. With a philosophy of being “committed to marrying science with nature to create clinically tested, drug free, quality products that deliver on their promise,” it’s no wonder why this company is the third largest pharmaceutical-grade cosmetic manufacturer in Europe. What makes this company’s products so effective and innovative is their Herbal BioComplex B11, a scientifically formulated and clinically tested blend of natural and plant based ingredients including herbal extracts, natural minerals, and essential fatty acids, that claims to do wonders for your hair and scalp. 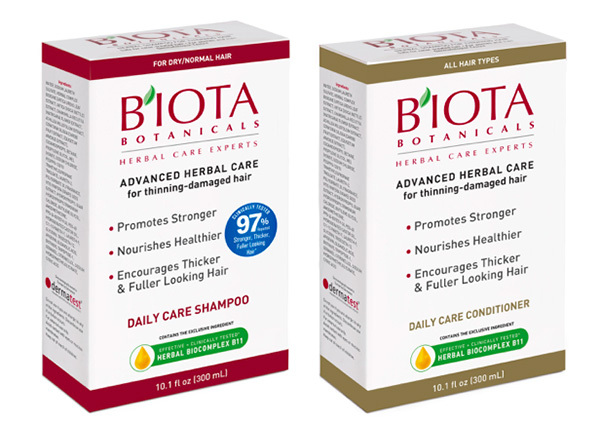 Biota’s Advanced Herbal Care Shampoo and Conditioner, for thinning and damaged hair, contains very high quality, advanced ingredients, like the brands infamous us Herbal BioComplex B11 formula. The shampoo comes in three formulas, normal/dry, dandruff control, and oily, and can be used on a variety of different hair types. If the two products are used together, and on a regularly basis, they claim to be able to support fast hair growth, and revitalize your scalp and follicles for thicker and healthier hair. It also claims to reduce scalp build-up, and take away any excess oil in your hair without stripping it of its natural oils, which also makes this product a great option for those who have oily or combination scalp. The Advanced Herbal Care Intensifying Formula Hair Masque is formulated with herbal plant based proteins, panthenol, Argan oil, and powerful antioxidants, such as Vitamins B5 and E, to encourage your hair to look and feel thicker and healthier. This lightweight mask also claims to protect and balance your hair from signs of environmental wear and tear caused by sun damage and the using water with harsh chemicals that disturb your scalp’s pH balance. One of our favorite things about this product is its moisturizing and nourishing formula that also looks out for and addresses signs of aging in your hair. 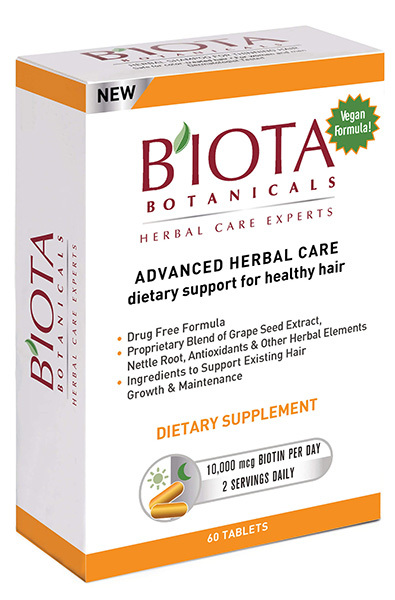 The Advanced Herbal Care Dietary Support is a unique and drug free dietary supplement that contains the perfect amount of nutrients, herbal extracts, and everything your hair needs to support and maintain healthy hair growth. Some of the more interesting ingredients in the dietary supplement include horsetail, grape seed, and nettle root extract. These ingredients help to support the innovative Herbal BioComplex B11 formula that’s in all of the brands products. The instruction say to take one dietary tablet twice a day, preferably with a meal. To get the most back for your buck and the best results use this supplement in conjunction with the other Advanced Herbal Care product line. 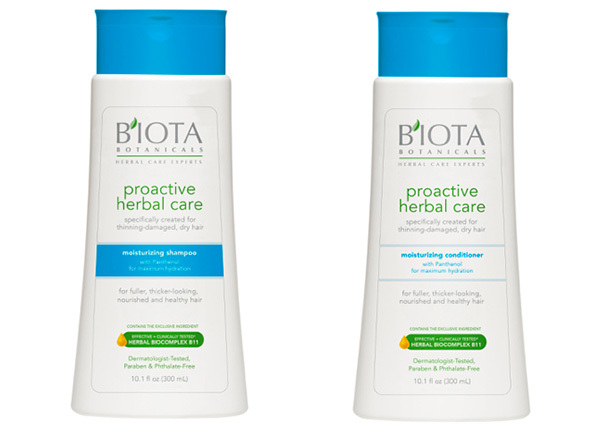 The Proactive Herbal Care Moisturizing Shampoo and Conditioner are a part of the Biota’s Proactive Herbal Care collection, and is infused with a blend of the Herbal BioComplex B11. The two product’s lightweight and moisturizing formulas claim to be able to reinvigorate your scalp and hair follicles, while supporting the growth of nourished, thick, and healthy looking hair. The inventive formulas of the two products completely surround each hair shaft with several protective layers to deeply hydrate your hair with herbal botanicals and other nutrients and minerals that address and support the needs of your hair. At first we weren’t too sure how well these products would work on fine or thinning hair, but rest assured we at My Top Face can confirm that this shampoo and conditioner will not leave your hair feeling heavy and weighed down with product, but will leave your hair looking fuller, shinier and more voluminous. 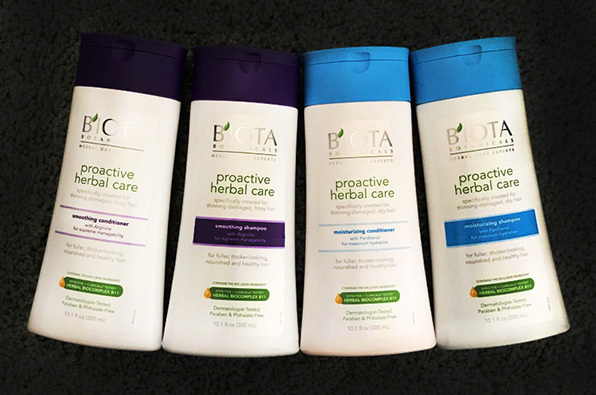 The Proactive Herbal Care SMOOTHING Shampoo and Conditioner were made to help bring manageability to your hair by taming fly-always, reducing frizz, and helping to make your hair more sleek and smooth to help you manage and style it better. 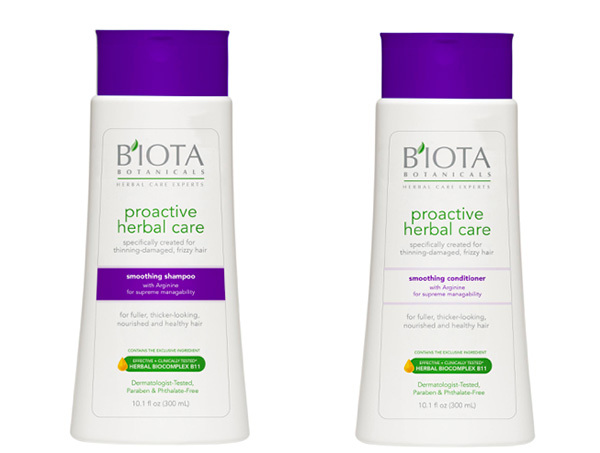 Along with the other products in the Biota product line, the shampoo and conditioner contain the company’s Advanced herbal blend called Herbal BioComplex B11 that perfectly nourishes the scalp with fatty acids, minerals and herbal extracts, as well as other ingredients that help to support the daily maintenance and care of your hair. If you suffer from pattern baldness, thinning hair, damaged hair, or all of the above, and you’re looking for a product line that is affordable convenient and effective. 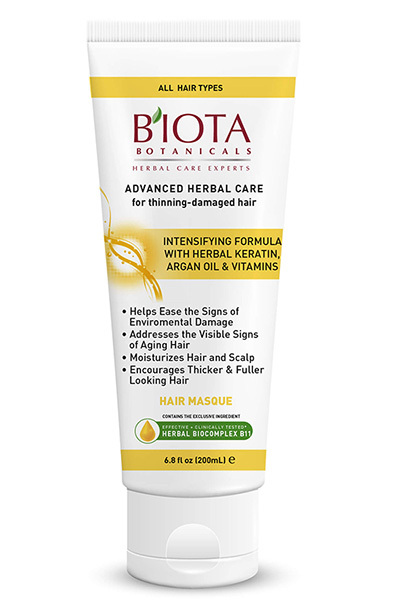 We at My Top Face believe that the Biota Botanicals line of herbal hair care are all of those things. Each product comes in reasonably sized bottles that are easy to handle and store away. All of their products are color coded so that it’s easy to distinguish each product from the other when you’re in the shower. Each product has a pleasant floral, clean fragrance that isn’t at all overpowering. The lightweight formulations of each product make them gentle enough to be used on an every bases, however some of us at My Top Face were still able to enjoy and see results from products even without using them daily. We were very impressed when we started to notice improvements to the strength, elasticity of our hair even after only using the products for a week. That says a lot about how powerful the ingredients used are and how well these products have been formulated. Before you go off spending a lot of money on some other hair loss system another great thing about this product line is how wonderfully affordable and readily available they are. You can buy them on their website, on amazon, and at most major drugstores.